Now that counting scales can store information electronically, piece count weights can be measured once and stored, rather than weighed again and again each time a new count must be taken. Counting scales, as their name implies, are most often used for counting like-parts, which is useful for such areas as parts distribution, warehousing, manufacturing, and inventory management. When counting large amounts of small items (such as nails or screws) it is important to be able to count them quickly and accurately. Counting by hand is time consuming and subject to human error. Counting scales count by weight. By weighing a known number of parts and entering the count, the scale can divide for the weight of each piece and use that to determine the count of subsequent weight measurements. The counting scale divides the total weight by the known number of items for future piece counting. In some cases, it is convenient to use counting scales for general weighing or checkweighing rather than using a separate machine. Some scales allow the input of upper and lower bounds for checkweighing applications. However, counting by weight is the most prevalent application. When using counting scales, there are two common problems that cause inefficiency: inaccurate piece count weights and the fact that accuracy can be affected drastically if the parts counted are not exactly the same weight. Often there are small differences in weight from piece to piece. Even products that are mass produced from reliable materials can have subtle differences in composition, size, and therefore weight. This effect is negligible when counting small numbers of pieces, such as 10 nails. But when counting 100s or 1000s of one product, this effect is exacerbated and can cause significant miscalculation. Any miscounting causes problems for the company. Undercounting shortchanges the customer and causes customer dissatisfaction. Overcounting shorts the company, causing consistent loss of profit. Inaccurate piece count weights cause similar problems by not getting an accurate weight for the individual pieces in the first place. The initial mistake spreads to each subsequent count and can cause major miscalculations before it is caught and corrected. Both of the problems described above can be solved by the same solution: larger sample size. In the past, taking large sample sizes would cost companies time and labor costs that they could not afford. Taking even five extra minutes to ensure a larger sample size and a careful measurement was not worth the extra cost in wages. Often, inaccurate piece count weights are taken because it is faster and easier to select a small sample size to weigh. However, small sample sizes do not give accurate average weights, so what saved time at the outset can cost money in miscounting in the end. The larger the sample size, the more accurate average weight can be measured. Not only does this ensure a more accurate piece count weight, but it also reduces the effect of non-uniform weights between pieces. Basic statistics states that the difference between pieces contributes less to the overall average when more pieces are measured at once. At one time, counting scales were expensive, and if companies wanted this type of accuracy they would rent scales once or twice a year for periodic inventory. Fortunately today’s scales are affordable to own and are able to allow taking large sample sizes worthwhile for companies that use counting scales and software. Products like Fairbanks Scales’ Omega Counting Scale (OCS) and Product Look Up (PLU) software make using large sample sizes more feasible than in the past. Now that counting scales can store information electronically, piece count weights can be measured once and stored, rather than weighed again and again each time a new count must be taken. Taking the time to carefully weigh a large sample size in the beginning will increase overall accuracy, and will eventually pay for itself in profits that were previously lost due to miscounting. Storing up to 999 PLUs in the Omega Counting Scale, with the help of the PLU manager software, means every product can be accounted for, and the associated information can be stored for easy retrieval later. Not only does this save profits, but it saves time and energy and reduces overhead. Rather than using a smaller sample size every time a product must be counted, a larger and more accurate sample size can be used once and pulled up again quickly for use the next time it is needed. All that time measuring multiple piece count weights can be used to streamline company operation. Overhead is reduced by minimizing inventory levels and making use of a more efficient work place. Companies can maintain a “just-in-time” delivery method and have less product taking up shelf space. It all comes down to the larger sample size. 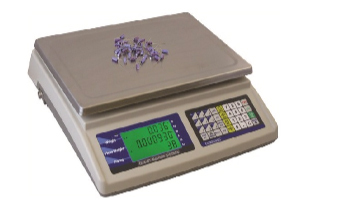 Modern counting scales provide companies with a method of using larger sample sizes in measuring piece count weights without losing money to extra man-hours. Once they can consistently use these larger sample sizes in their measurements, accuracy is drastically improved and overall efficiency increases. All of this saves companies time and money, and helps make their operation run smoothly and reliably.